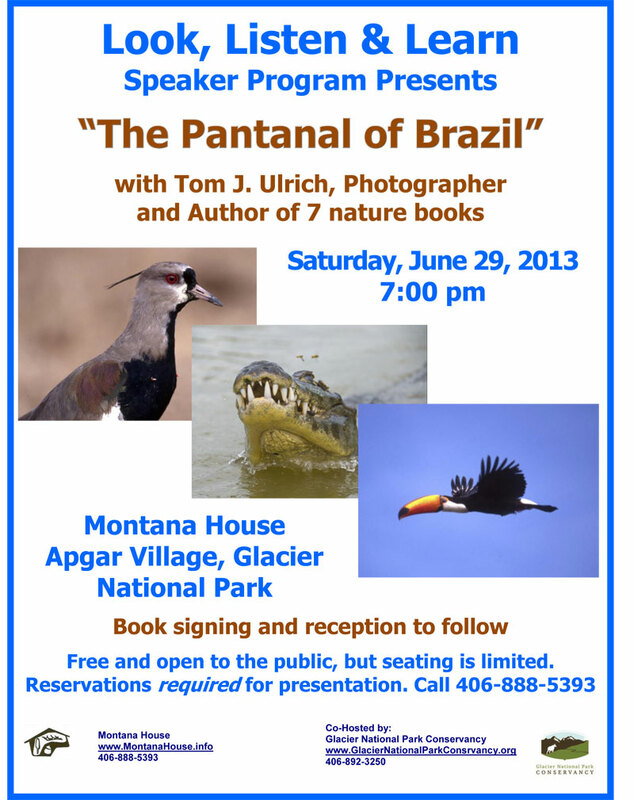 The Montana House and the Glacier National Park Fund are pleased to co-host another in the series of “Look, Listen & Learn” programs at the Montana House in Apgar Village inside Glacier National Park. 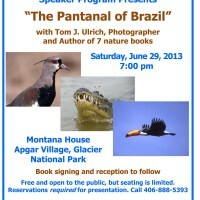 The featured photographer/author from West Glacier, Montana is Tom J. Ulrich with his presentation at 7:00 p.m. Saturday evening June 29, 2013. The Pantanal is one of our planet’s most spectacular wetland systems, located in the center of the South American continent, south of the Amazon basin and east of the Andes. It is an immense landlocked river delta where annual floodwaters regularly rise several meters and then recede. About 80% of these flood-plains are submerged during the rainy seasons, nurturing an astonishing biologically diverse collection of aquatic plants and helping to support a dense array of animal species. The name “Pantanal” comes from the Portuguese word pântano, meaning wetland, bog, swamp, quagmire or marsh. The Pantanal is one of Ulrich’s most favorite locations to visit. He has spent extended time there photo-graphing the diverse fauna. The program will run a little over an hour showing photos from his vast collection taken throughout the years.